The lifeboats released as the boat ran aground last July. AN INTERIM INVESTIGATION into the sinking of the tall ship Astrid off the coast of Kinsale in Cork has said that the failure of the engine was critical. The 150-tonne Dutch vessel was travelling from Oysterhaven in Co. Cork to join a flotilla taking part in a sailing festival between Oysterhaven and Kinsale when it ran aground on 24 July last year. There were 30 people on board the ship and all were rescued safely but the ship was so badly damaged from its sinking and subsequent six weeks on the rocks that it was deemed a write-off when it was salvaged. The interim investigation by the Marine Casualty Investigation Board is not intend to apportion blame or recommend prosecutions but to make recommendations to avoid similar incidents in the future. At about 11.35 am sails were being hauled and the course was altered. Whilst hauling sails the engine was still being used and the ship proceeded in a SW direction at a speed of approximately 3 knots. At approximately 11.40 am the engine failed and the ship was unable to sail out of the situation that grounded the Astrid on the coast 0.7 NM North West of the Big Sovereign. The investigation into the sinking has so far concentrated on verifying the facts of what happened. Further legal investigations in to the sinking will be lead by Ireland with Netherlands as a participating state. 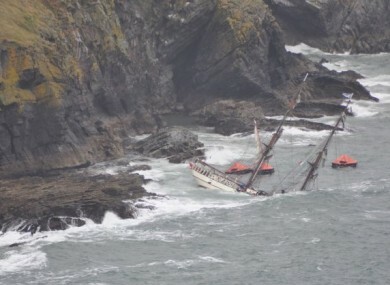 Email “Engine failure on the Astrid meant it couldn't escape Kinsale's rocks”. Feedback on “Engine failure on the Astrid meant it couldn't escape Kinsale's rocks”.